Nature walk to river Kosi. Jungle lodge is place for the visitors wanting a real wildlife experience, have six beautifully crafted deluxe cottages called 'Jungle Cottages' set under the shade of glorious mango trees with view of lawn and private outside sitout, these quaint eco-lodges merge into the beautiful surrounding and the mango orchard and eight deluxe cottages called 'Orchard & River View Cottages'. Inspired by the design of cottage, have two balconies opening in the orchard as well as the river side. The lodge also has few rooms and tents for adventure camping to accommodate large families, corporates, institutional, other than school and college study tour groups who like to travel in budget and to explore the wilderness of the corbett park. You can enjoy all the advantages and excitement staying in the forest, along with all the modern amenities, comforts and luxury. All the cottages are air-conditioned and has a generous living space inside, with large windows, custom-built furniture and a modern en suite bathroom. The wide verandas in 'Orchard & River View Cottages' are an oasis where you can unwind and enjoy the sights and sounds of the forest and river in solitude. The verandahs offer panoramic views of the lawns and orchard and forests and are ideal for birdwatchers. From homely budget hotels to sheer luxury resort stay we offer every guest and group value-for-money accommodation ranging from deluxe to luxury rooms. Jungle lodge is among the 10 best corbett park hotels and resort near river and inside jungle enroute from bijrani gate to dhikala gate. Celebrate wedding in corbett park Hotel and Resort, an anniversary or a birthday, plan team building weekends in corbett park or simply unwind with family–whatever you wish to do we promise you a memorable time with us. There are large sprawling lawns within corbett hotel and resort for sports, games and celebrations, family swimming pool (under construction) to beat the summer heat and roaring bonfires in the evenings to warm up the winter chill. Come any long weekends and festival breaks you can also book lively evenings at the Corbett Hotel and Resort with local folk singers and dancers, acoustic guitars, and special lip smacking menus. The lodge also facilitate the yoga, meditation & wellness programs time to time, that are conducted at the lodge by Yogic Teachers & expert masseurs. Do write to us for detailed programs and courses that we offer. The lodge also offers weekend programs for detox & stress management. If you are looking for an cheap, budget or luxury five stay hotel accommodation near corbett park, then your search ends here. 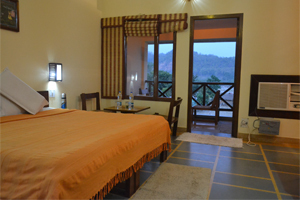 Corbett Hotel and Resort is few minutes drive and near bijrani and dhikala zone of corbett park. Find best traveller reviews and photos and one of the best amongst top 10 Jim Corbett Park Hotels and Jungle Resorts to book at best price on internet for Corbett Park. Corbett Park Hotel and Resort has a great deal to offer in itself, its prime attraction undeniably lies in its location and proximity to corbett park. Corbett Resort and Hotel is spread over four acres of land, located at dhikuli village enroute from bijrani gate to dhikala gate of corbett national park, corbett resort is surrounded with a breathtaking view of the corbett forest by one side and kosi river by other side with just few minutes walk away.